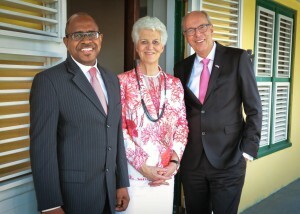 ORANJESTAD - The Board of financial supervision Bonaire, Sint Eustatius and Saba (Cft) has stressed during its visit to Sint Eustatius on December 14 that the lacking visible results in terms of improving financial management must now quickly and effectively be implemented. “There was willingness of Sint Eustatius to address the capacity problems, but in recent months this has not led to a well-functioning Finance department”, Chairman Age Bakker stated. The temporary hiring of support did result though in improvement of the accounting processes during 2016, reason why the reports have been submitted. During its visit the Cft met with the Executive Council and the Island Council. The Cft has noted that the quality of the financial management has improved during 2016, but this is mainly on account of the temporary support that was made available by means of a contribution from the Ministry of Interior Affairs and Kingdom Relations. This temporary support however in the long term offers no solution in arriving at a solid Finance department. The lack of visible results to structurally reinforce the Finance department was discussed. Although the need and willingness to build up a solid and capable Finance Department has been recognized during previous visits by the Executive Council, this has so far not led to sufficiently concrete actions to actually address the problems. The Executive Council has informed the Cft further about the steps it intends to take in the short term to tackle the problems after all. During the visit the budget and accounting process were also discussed. The 2015 financial statements have been prepared and are currently reviewed by the external auditor. The projected shortfall will have to be entirely offset in the 2017 budget. The Cft has indicated that the expected deficit of around USD 631,000 for 2015 may still change as a result of the audit, and if that is the case this has to be processed in the 2017 budget. The understanding of the budgetary execution in 2016 has been greatly improved with the assistance of the temporary support. Based on the budget exhaustion until September, Sint Eustatius expects to break even, while on the expenses side the compensation of the deficit of approximately $ 506,000 as reflected in the financial statements 2014 was taken into account. The Cft also discussed with the Island Council the increasing current liabilities for amongst others pensions and the possible financial risks that may result from these. The Minister of Interior Affairs and Kingdom Relations has withheld his approval of the 2017 budget. Sint Eustatius government will have to act firmly so that in the foreseeable future it can follow-up on the decision making of the Minister of Interior Affairs and Kingdom Relations and the recommendations of the Cft. During a working visit the Cft received information about the sustainable development at the energy and water company STUCO and the impact on the public entity and the Sint Eustatius residents. The Cft congratulated STUCO director Fred Cuvalay on the inclusion of STUCO in the Durability top 100 published by the Dutch newspaper Trouw.